It sounds as if Singer have tried to produce a budget sewing machine that does it all, dressmaking, quilting, embroidery and more. 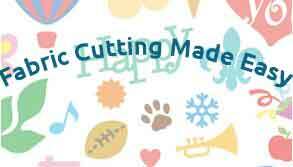 There are many claims about what is the best sewing machine for quilting, so let’s take a closer look and see what the Singer Confidence Quilter can do. Easy Threading System – The instructions are printed directly onto the machine to guide you through the threading sequence. Drop & Sew™ Bobbin System – Get started sewing quickly by simply dropping the bobbin in, no need to raise the bobbin thread with this system. StayBright™ LED Lights – The StayBright long-lasting bulbs will give you thousands of hours before they need replacing. There are 2 lights illuminating the sewing surface so no eye strain with this machine! 100 Built-In Stitches – This is the bit I like, the creative part! The SINGER 7469Q has a good selection of built-in stitches. There are all the basic ones plus embroidery, quilting and more. In the Manual, there’s a stitch guide which shows you how and when to use the stitches. 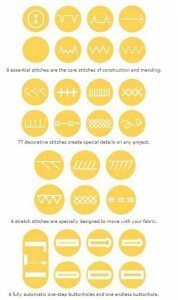 There are 8 basic stitches, 6 stretch, 77 decorative and 7 buttonhole types to choose from. There are also 6 fully automatic buttonholes. If you’ve had problems making buttonholes in the past this machine should solve that! 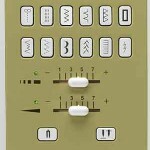 Easy Stitch Selection – The control panel allows for easy stitch selection. Extension Table – This is included in the package, an essential for quilting so great you don’t have to purchase it as an extra. Drop Feed and 6-Segment Feeding System with Box Feed – Another essential for quilting if you do free motion quilting and embroidery. This system means the fabric is picked up and supported from the front to the rear of the pressure foot. Great for quilting as it means more accurate fabric feeding. Box feed means the feed dogs don’t move in the normal arc motion but in a box motion. This creates equal contact between the fabric and the presser foot. Programmable Needle Up/Down – I love this feature! You can program the needle to stop in the down position, really useful for piecing. pivoting and applique. Electronic Twin Needle Control – Stitches are adjusted automatically for sewing parallel rows of decorative stitching. Automatic Tension – Fed up fiddling to get your tension right everytime you change thread or fabric? The automatic tension solves this, brilliant! 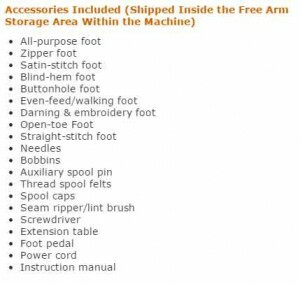 Automatic Presser Foot Control – Pressure against the feed dogs is automatic, no adjustments are needed when you change fabric types. There is also an Extra-High Presser Foot Lifter for more clearance when working with bulky fabrics or multiple layers. Automatic Stitch Length & Width – The optimal settings can be overridden so you can choose your stitch length and width depending on the project. Automatic Tacking Stitch and Tie – Off- This is useful for tying off decorative stitches at the start and end of the pattern and reinforcing the end of seams. Automatic Bobbin Winding Clutch – Great for bobbin winding as the needle bar disengages automatically. The SINGER 7469Q Confidence Quilter also has a heavy-duty metal frame. a direct drive, snap on presser feet and 13 needle positions. How does the SINGER 7469Q Perform? For a machinein this price range it performs well in some areas. The stitches are straight and the clear plate makes it easy to see if you are running out of bobbin thread. It’s easy to thread up because of the guide system and the DC motor means instant start and stop with no lag. The throat space is not massive but at about 5.5″ wide and 5.5″ high, you could feed a full-size quilt through as long as it’s tightly rolled. 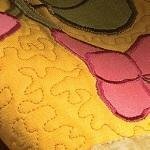 With the included walking foot attached, it manages a good even feed through the 3 quilt layers with accurate stitching. 25-Year Limited Warranty – on head, five years on motor and electronic components, and one year on belts, bulbs, and attachments. The LEDs lights aren’t bright like the description, you’ll probably need and additional desk lamp. Some parts feel plastic and flimsy, like the thread holder and feet for example. It resets the stitch length when switched off so you always need to remember to redo your settings. There’s very little in the instruction manual that covers the quilting side. It’s picky about thread, you need to use good quality thread and use the same top and bottom. Some people are complaining of breakdowns after a years + use, it’s not a workhorse like the Singer S18 or the Janome Memory Craft. 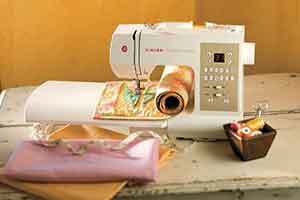 The Singer 7469Q sews a good straight stitch and is easy to use straight out of the box. Although the instruction manual doesn’t cover quilting, what is there is easy to follow. Good for beginners as well as more advanced sewers. It comes with an extension table and walking foot included. It’s a great price! It’s light and compact enough to take to sewing groups and classes. This sounds like it would be a good starter machine. My daughter has shown some interest in sewing, would this be a good machine to start with or would you think that`s to advanced? She is a beginner. I’m using a Juki sewing machine for dressmaking. I’ve never used a computerised sewing quilting machine before. The built-in stitches function sounds great, I’ll like to try it! Get The Best Sewing Machine for your Budget!